MSRP $191,124. 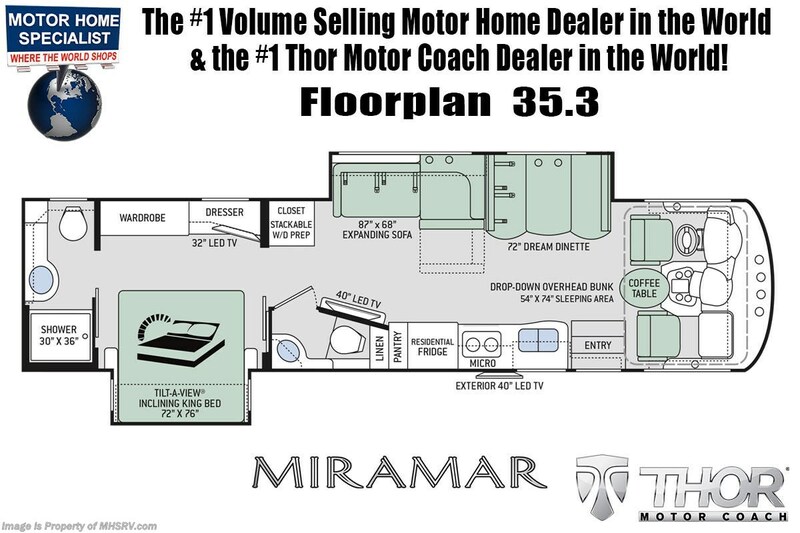 The New 2020 Thor Motor Coach Miramar 35.3 Bath & 1/2 class A gas motor home measures approximately 37 feet in length featuring 2 slides, king size Tilt-A-View bed, Ford Triton V-10 engine, Ford 22 Series chassis, high polished aluminum wheels and automatic leveling system with touch pad controls. New features for the 2020 Miramar include décor updates, new dash design with the “floating radio” look, multiple USB charging stations throughout, combination induction & gas cook top, backlit Firefly entry switch plate, Winegard ConnecT WiFi Extender +4G and much more. Options include the beautiful full-body paint exterior, fireplace with remote, and frameless dual pane windows. 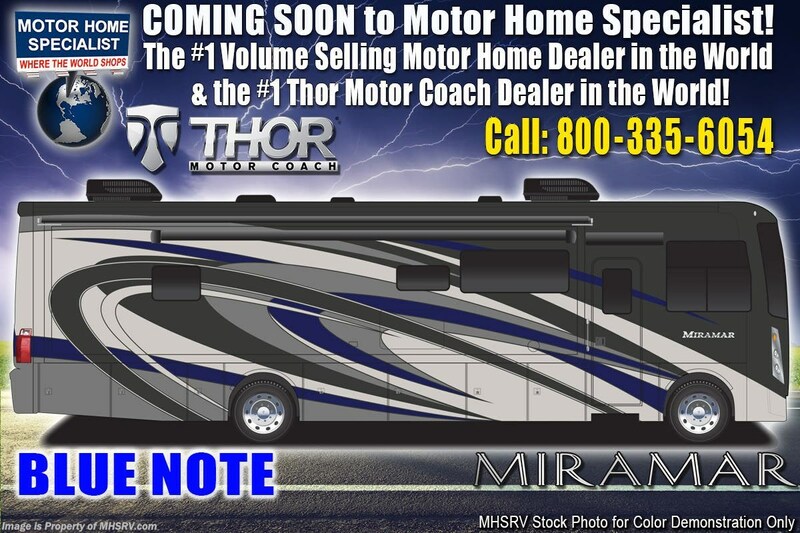 The Thor Motor Coach Miramar also features one of the most impressive lists of standard equipment in the RV industry including a power patio awning with LED lights, Firefly Multiplex Wiring Control System, 84” interior heights, raised panel cabinet doors, convection microwave, frameless windows, slide-out room awning toppers, heated/remote exterior mirrors with integrated side view cameras, side hinged baggage doors, heated and enclosed holding tanks, residential refrigerator, Onan generator, water heater, pass-thru storage, roof ladder, one-piece windshield, bedroom TV, 50 amp service, emergency start switch, electric entrance steps, power privacy shade, soft touch vinyl ceilings, glass door shower and much more. For more complete details on this unit and our entire inventory including brochures, window sticker, videos, photos, reviews & testimonials as well as additional information about Motor Home Specialist and our manufacturers please visit us at or call 800-335-6054. At Motor Home Specialist, we DO NOT charge any prep or orientation fees like you will find at other dealerships. All sale prices include a 200-point inspection, interior & exterior wash, detail service and a fully automated high-pressure rain booth test and coach wash that is a standout service unlike that of any other in the industry. You will also receive a thorough coach orientation with an MHSRV technician, an RV Starter's kit, a night stay in our delivery park featuring landscaped and covered pads with full hook-ups and much more! Read Thousands upon Thousands of 5-Star Reviews at and See What They Had to Say About Their Experience at Motor Home Specialist. WHY PAY MORE?... WHY SETTLE FOR LESS? 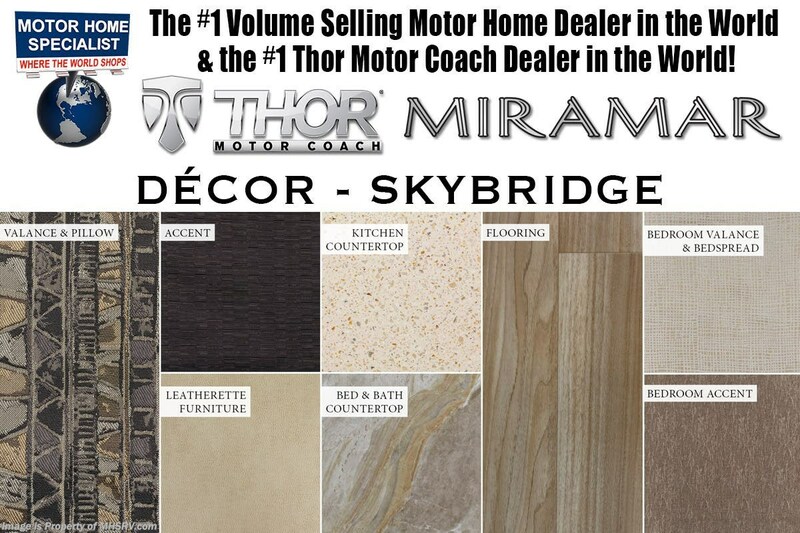 Check out Stock # MTH032008711 - 2020 Thor Motor Coach Miramar 35.3 on thorrvsource.com!